Oscar-winning actress Rachel Weisz delivers a one-two punch as producer and star of Disobedience, playing a New York photographer who returns to her Orthodox roots in north London, with explosive consequences. Hilton Als interviews Weisz and co-star Alessandro Nivola about their enduring friendship and intense filmmaking. Brit-born actress Rachel Weisz has made a career of choosing films that delve deeply into the psyche of humanity and tell multidimensional stories of brave and intelligent women. Her performance as the idealistic wife of a British diplomat in The Constant Gardener won her an Oscar, sealing her status as one of film’s most compelling actors, whose credits include this year’s upcoming The Favourite from Yorgos Lanthimos, Terence Davies’ The Deep Blue Sea (2011) with Tom Hiddleston, and the Broadway play Betrayal (2013), alongside her husband Daniel Craig, with whom she is expecting a child, their first, at the end of the year. Wearing the dual hats of actress and producer, another first, Weisz brings a piece of history to life in Disobedience, based on Naomi Alderman’s award-winning 2006 debut novel about a young photographer’s return to her roots in the Orthodox Jewish community of Hendon, North London. Facing opposition within her community and family, the daughter of a recently deceased, highly-respected Rabbi, Ronit (Weisz) grapples with the differences that have grown between her and beloved cousin Dovid, played by Alessandro Nivola, and his wife, Esti, played by Rachel McAdams, in a setting where emotions are neatly contained and female desire unraveled. Exploring the darker side of the human condition, Weisz allows the viewer to share deeply in her experiences of great loss and longing. Directed by Sebastián Lelio, and produced by Frida Torresblanco, Disobedience, with cast performances both brilliant and poignant, ultimately shows faith in a new light. “Disobedience was born from a creative exploration with Rachel looking to find transgressive roles—bold, intelligent, and determined women that have real journeys with authentic voices. Voices that have long been silenced. This movie talks about the freedom to choose. Sometimes we live restrained in a slavery of religion, beliefs, or social conventions. This is an invitation to take off the corset,” says Torresblanco. Hilton Als: Disobedience is an extraordinary movie about intimacy, and the complications of knowing other people. It’s a beautiful film. I’ve seen various versions of it, and I never seem to lose my interest in what happens to the people in it. There’s a three-part piece about a Hasidic community in Crown Heights that was published in The New Yorker in 1985 by a writer named Lis Harris. It’s called “Holy Days,” and it begins with Lis finding a photograph in her mother’s box of photographs of a Hasidic man, wearing a hat and coat, and so on, and she asked her who it was—was it a relative? And her mother said, “Nobody in our family.” And this idea of being Jewish and secular, not wanting to be marginalized further, was something that the piece is about. But really in the end, it’s not about religion, it’s about difference in the community. When you first came across the novel, Rachel, were you interested in this idea of the individual? What was the appeal of this part for you, originally? Weisz, Rachel McAdams and Alessandro Nivola in Disobedience. 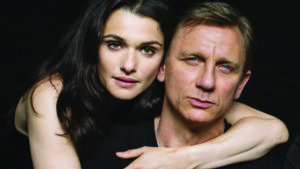 RACHEL WEISZ: Well, I grew up on the Northern Line on the Tube in London. Golders Green was my stop, and three stops farther north is Hendon, an Orthodox community that is completely insular, one that I really didn’t know anything about. The people are really hidden and private. And I thought it was so extraordinary that I grew up three Tube stops away, and I didn’t know anything about their world. That’s what appealed to me. Als: Were you trying to tell the story about someone who knew the language? Weisz: Yes, definitely. Someone who had escaped, but hadn’t really escaped. Sebastián [Lelio], the director, once said that he felt, and this is quite abstract, that Esti’s character and my character were two halves of one person. She’s the half that stayed behind, and I am the half that left. Als: James Baldwin once said that you carry your home with you, otherwise you’re homeless. And I feel that when she comes back, and sees Dovid, she’s bringing shame into the house all of a sudden—the shame of having known her and having had feelings for her. Alessandro, as a performer, how does one attempt to convey that, but not through language? Was there room for improvisation? ALESSANDRO NIVOLA: Do you mean how to convey that she was bringing shame into the house? Als: That he was always ashamed of her history, that she hadn’t turned out to be the girl that he needed. Als: Depends on the day. [laughter] One of the startling things about the film goes back to this idea of the reality of intimacy. Actors don’t necessarily get to play that on-screen much anymore. Can you tell me about the building of the script to those points? Was there a stripping away from the original script? Weisz: I think what changed from the novel to the screenplay was that Sebastián kept all three characters. You know, there are three leads, which is quite unusual. I think his empathy as writer and director was with each of them, and there was no antagonist. In the novel, the uncle is kind of the bad guy. So he was the antagonist. And then Sebastián cast Allan [Corduner], and Allan is the sweetest uncle I’ve ever seen in my life. He was just adorable and warm and, you know, he doesn’t approve of his niece, but he’s adorable. I think that was something Sebastián really wanted to keep an eye on the script, and the casting was that, you know, there is no antagonist. Sebastián says the antagonist is within—we have our own antagonist inside us. So I would say that was the biggest difference between the novel and the screenplay. But the novelist actually grew up in this community. She grew up in Hendon, and she left the community and wrote this novel. It was a very personal piece of writing. Nivola: Surprisingly, there were a lot of people from the community who were interested in helping us, mainly because they wanted us to go as right as possible. They were all a little bit nervous about how their community would feel about their being involved in the film. But ultimately, so far at least, there hasn’t been any negative response from the community. Everybody who has seen it from the orthodoxy has felt that it was a very delicate telling of the story. It wasn’t to indict their religion in some way. There were about three different people from the community who were on set telling us about all the different ritualistic things and behavior that we needed to get right. I started hanging around Crown Heights, at a clothing store called Primo Hatters—which I recommend everybody check out at some point if they want a really great fedora, because they have every kind, and some that are very Hasidic, and some that look gangster. I told a few people there I was going to do this film, and they took an interest in it. I found this one guy who I’ve really gotten close with, and he just recorded everything into my iPhone, and I played it a million times. Weisz: You really learned it. Als: One of the beautiful things about your performance is this mournfulness—Dovid is so afraid of not achieving what he’s set out to achieve. And one of the things I loved about the interaction between your characters is that she’s saying Dovid, it’s OK to fail. It’s not the worst thing that can happen to you. It’s a beautiful part of the love story. You both had worked together previously? Nivola: We did, 20 years ago, on the film I Want You. Weisz: No one saw it, but I’m proud of it. It was really incredible, based around the Elvis Costello song, “I Want You,” which sounds like a strange premise for a film, but there’s a lot of longing in that song. Weisz: …with a flawless English accent. Nivola: It was a movie that led to half my career being spent over there, which wasn’t by design. Weisz: It’s a beautiful thriller, shot by a Polish cinematographer who used all these colored lenses, so it didn’t look like the south of England. It looked like some Polish romantic messed-up love affair. Als: Alessandro, I first saw you in Love’s Labour’s Lost [in 2000]—beautiful work. Nivola: The upside was that I met my wife [Emily Mortimer]. The downside was that it was one of People magazine’s 20 worst films of the year. Als: I love the energy of the performers. Obviously, with Shakespeare, you’re dealing with a different kind of script. On this production, was there room for you to play with the language? Nivola: The hard thing about films and writers is that they’re kicked to the curb pretty early on in the process once the actors arrive on set. Als: Actors, if they’re brilliant—that’s why they get the big bucks, because you couldn’t imagine it when you were typing the story. They rewrite it, and you have to let them do that. Rachel, when you’re producing a movie, do you generally have a vision or a look that you’re trying to achieve? As an actor, there’s the other hat, which is to be as open to possibility and chance as possible. It’s a very difficult thing to do, because you have to use one side of your brain to help manage and the other side of your brain to lose control. Can you tell me about that potential struggle or joy? Weisz: Yes. This is the first film that I’ve produced. I haven’t got tons of problems to talk about. Working on the adaptation from novel to script and going through drafts, you’re definitely using a very different side of your brain than acting. The moment filming began, I just became an actress. There was no left-right. I wasn’t running around producing. And you’re right, you have to lose control to turn off the thinking completely, and use some other part of your brain. And then I kind of re-engaged with that other bit during post production. Als: Were you familiar with Sebastián’s prior work? Weisz: A lot of people have seen Gloria, his Chilean film about a woman in her mid- 50s exploring her sexuality and dating. It’s quite genre-shifting. Nivola: He’s just re-made it with Julianne Moore, as an English-language film. Weisz: It’s very unusual to put a woman of that age in a film and explore sexual desire and longing. There’s a lot that’s very moving, and it was funny. It blew me away. Als: I was so impressed by your physicality in Disobedience. The way Ronit walks is so distinctive. It’s almost as if she’s trying to maintain being upright without tripping over her own self. Weisz: I was just thinking, it was the boots I was wearing [laughter] as you said that. But I spent a while choosing the boots. That stuff is, for me, completely unconscious. I actually don’t quite know what you mean.